The Greek government is having a hard time of it at the moment. Only today the Finance Ministry issued a statement that it was ready to "intensify its efforts to restore the viability of fiscal and economic trends in Greece" in response to the Moody's decision to downgrade the country's credit rating, while just one week ago the Finance Minister was accusing Standard & Poor's of failing to "assess correctly" new moves by Athens to tackle its swollen budget deficit - echoing a similar response from Spanish Prime Minister José Luis Rodriguez Zapatero. George Papaconstantinou's critical outburst followed the earlier downgrade decision by the rating agency of the nation's long-term sovereign debt. Today, the Greek Government got the answer they should have expected, since Moody's effectively followed the path of the other two main agencies (Fitch already have the Hellenic Republic on BBB+) and downgraded Greece to A2 from A1. The move means Greek debt is one step closer to being cut off from eligibility as ECB collateral, since Moody's have put the rating on negative outlook, which means they consider a further downgrade more likely than an upgrade over the next twelve to eighteen months, while the ECB are scheduled to revert to the pre-crisis criteria of only accepting Sovereign Bonds which retain at least one A- from one of the main ratings agencies as collateral for lending. Certainly Lucas Papademos, ECB vice president, said last week that the ECB would not change plans to tighten its collateral rules in December 2010 simply to accommodate Greece. My reading of the situation is that Greece now has till December 2010 to convince the Ratings Agencies, the EU Commission and the ECB that they mean business and have a viable plan, or they are off to the IMF. And in fact I am not very optimistic they can comply with this constraint. Moody's takes a rather different view however. “Moody’s believes that Greece is extremely unlikely to face short-term liquidity/refinancing problems unless the European Central Bank decides to take the unusual step of making the sovereign debt of a member state ineligible as collateral for bank repurchase operations — a risk that we consider very remote,” according to Arnaud Mares, Senior Vice President in Moody’s Sovereign Risk Group. What I can't see is how the ECB can credibly avoid taking this step, since when it announced back in 2005 that it would not accept collateral without the A- rating, it was exactly this sort of situation it had in mind. Any backtracking now would be perceived by markets which are becoming extremely nervous about the topic of long term sovereign risk as a sign of weakness, one which was likely to open the door to more fiscal abuse in other states, and indeed it would be a decision which would be hard to understand for voters in Germany and France who may at some stage be asked to chip-in, and sort the growing mess out. So, indeed, I can't see how the ECB could credibly afford to not implement its threat. Reading between the lines in the EU Commission documentation at this point, I would say that EU institutions are steadily trying to put a procedure with teeth in place in order to avoid the need to send countries to the IMF, but this institutional hardening may not come in time to save Greece from humiliation. I believe that while there is not a complete consensus at this point, the eventuality of sending a eurozone member state over to Washington, while not being desireable, and being a sign of weakness, would in fact be seen as a lesser evil to that of allowing the situation to deteriorate further. It will have escaped no one's notice that Spain is very much in the early stages of a similar procedure, with any slippage in deficit targets putting the country straight back into the Excess Deficits Procedure with a fast-track enhancement, and what I feel no one wants to see happen is the situation in Spain deteriorating to the point it has now reached in Greece. We should also not fail to notice that Greece also had to raise 2 billion euros in debt via a private placement with banks last week, against a backdrop of credit downgrades and steadily rising spreads. The ECB undoubtedly agreed to this given the degree of policy coordination which must exist behind the scenes, since they are the ones who are financing the Greek banks, but it does highlight just how things have moved on in recent months, since only last year it was imagined that the Eurozone in and of itself gave protection from this kind of financing crisis, which was why only eurozone non-members, like Latvia and Hungary, were sent to the IMF. Now it is clear that while the ECB could keep protecting Greece from trouble till the cows come home, they cannot simply keep financing unsustainable external deficits and retain credibility (see this post for more background on all this). In this sense the financial crisis has now "leaked" into the Eurozone. And this has implications I would have thought, for countries like Estonia, who see eurozone membership as a "save all". And obviously, the EU authorities badly need to plug this hole in their armour, or the entire concept of the eurosystem can be placed at risk, which is why I think we won't see an explicit slackening in the minimum acceptable rating criteria. On Wednesday last week S&P reduced Greece's sovereign rating from A- to BBB+, and explicitly stated the measures announced the previous Monday were "unlikely on their own to lead to a sustainable reduction in the public debt". Moody’s add their weight to this and stress that the Greece's longer-term sovereign risks have only partly been offset by the government’s announced policy response. Fitch Ratings cut Greek debt to BBB+ on December 8. George Papaconstantinou, finance minister, responded in fighting spirit, and is quoted as saying "we don't think this [the S&P rating downgrade] reflects the efforts the new government is making to stabilise public finances which had derailed" - a reference to a collapse in revenue collection and excessive spending under the previous government. "It didn't take into consideration and didn't assess correctly what is happening at this point." But the whole point is that it was not only Greek finances which became derailed over the last decade, but the whole economic model on which Greek society has been based, and it is this derailment which needs to be fixed, and it is in this context that the measures which have been proposed fail to convince. Strangely many analysts seem to think today's decision by Moody's offers respite, and almost aid and comfort, to a hard pressed Greek government, simply because they only downgraded by one notch. Certainly Greek bond markets rallied sharply on the news, and the benchmark 10-year Greek government bonds jumped in price, pushing their yields down 22 basis points to 5.724 per cent, while 2-year yields fell 10bp to 3.359 per cent. This left the spread between German and Greek 10-year yields – a widely followed measure of european sovereign risk – at 2.5 percentage points, its lowest since last Thursday. Basically such observers seem to have been worried that if Moody's downgraded Greece into 'B' territory, as Fitch and S&P have already done, then Greek banks would no longer be able to exchange Greek government debt for cash in ECB refinancing operations. But I feel that these observers have - as is so often the case - gotten ahead of themselves. It was never really probable or credible that Moody's would go the whole hog in one foul swoop. The ECB strategy of cajoling Greece into making changes rests on the "carrot and stick" approach, and it is hard to see how the stick would work, if the carrot was suddenly removed. But remember, the threat is still there, since as I say, the outlook is still negative, and as Moody's themselves point out "the question of whether the negative outlook will evolve into a stable outlook or into a further downgrade will depend on the Greek government’s plan being followed through — as demonstrated for instance by a sustained increase in tax revenues and/or the effectiveness in reining-in expenditure". Prime Minister George Papandreou had vowed “radical” measures to fix Greece’s finances, and Finance Minister Papaconstantinou lifted the 2010 deficit-reduction target to 4 percentage points from 3.6 percentage points. That would lower the deficit to 8.7 percent of gross domestic product, still almost three times the EU limit of 3 percent, but a sizeable chunk of reduction for one single year, and a reduction which will almost certainly ensure that Greece remains mired in recession for most of 2010. The combination of a global post-crisis environment that is less favourable to Greek public finance dynamics (with increased risk discrimination and muted global demand) and an equally challenging domestic environment (with accelerating demographic pressure on public finances in coming years) will make any fiscal adjustment increasingly difficult and costly to postpone. 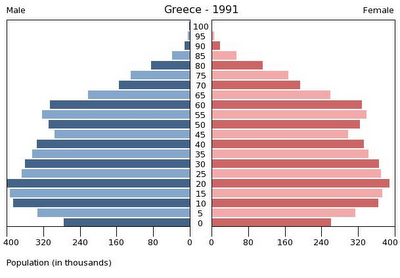 Basically Greece is one of the EU countries which will be most severely affected by the ageing process, as can be seen in the two comparative pyramids below. Simply put, in the space of thirty years it will move from being a society with a preponderance of young people to being one, where the over 50s predominate (the charts come from the US Census Bureau IDB population data base). 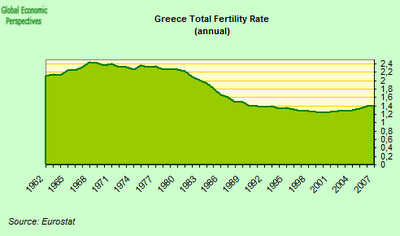 The principal reason for this dramatic shift has been the sharp fall in Greece's underlying fertility rate. 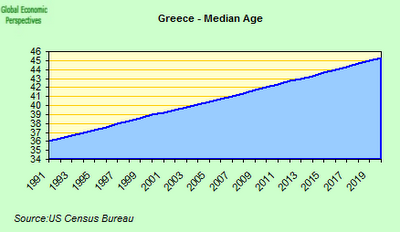 This, and increasing life expectancy mean that the median population age is projected to rise rapidly, making Greece - with a median age of over 45 - one of the oldest European societies (as well as civizations) by 2020. The older cohorts of the Greek Labour force will start retiring at a rapid pace after 2015, without an offsetting inflow among the younger cohorts. Total population is projected to peak in 2017 at over 11 million, and than to decline gradually to just around 10 million by the late-2050s. Working-age population will in fact peak in 2010, before declining somewhat faster than overall population. 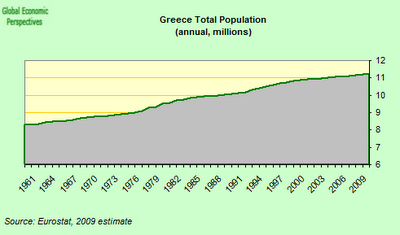 The structure of the population thus gradually shifts to more dependents (especially elderly). The dependency rate increases over time, implying additional pressures on pensions, health, and other entitlements. 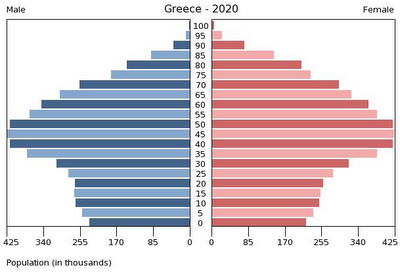 As can be seen in the chart below, without those much needed pension reforms, Greek pensions will consume a far higher proportion of national output in the years to come than the average level for the rest of the EU 15. So the Greek crisis is about much more than short term fiscal deficit issues, it is about the long term sustainability of a whole economic and demographic model. As such, Moody's are surely right, the short term liquidity problems undoubtedly have solutions, and it is the long term solvency ones we should be concerned about. During the years of easy borrowing, Greek industry became very uncompetitive, and Greek society dependent on imports. As a result the external debt went up and up, and currently stands at about 160% of GDP (gross) and 85% of GDP (net). Meanwhile Europe's leaders are caught between trying to reassure financial markets Greece won’t default on its debt while at the same time keep up pressure on the country to put its house in order. German Chancellor Angela Merkel said on December 10 Europe has a “responsibility” to help Greece. The following say, European Central Bank President Jean-Claude Trichet said the country must take “courageous action.” Both things are needed, but how I wish those responsible for policymaking in Greece would show more awareness of just how complicated this is going to be, for all of us.